​Just How Big is the Video Gaming Industry? Today we have a guest blog from Ben Johnson from WePC, a site to help you build your own gaming computer. 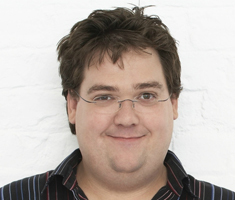 Ben's article is about how big the gaming industry is, more information below. Back in the days - in the 80’s, the video game industry was just a small-but-steadily-growing part of a larger picture. Today, the gaming industry is now generating not just hundreds of thousands or millions of dollars but billions of US dollars in revenues. In fact, Asia Pacific reached a revenue of 51.2 billion U.S. dollars in 2017, making them the largest gaming market in the said year. The video gaming industry has been generating billions of dollars for many years now and in 2016, the value of the video game market in the United States was 17.68 billion U.S. dollars. Initially, there were two categories under the video games umbrella, and these are console games and computer games, respectively. 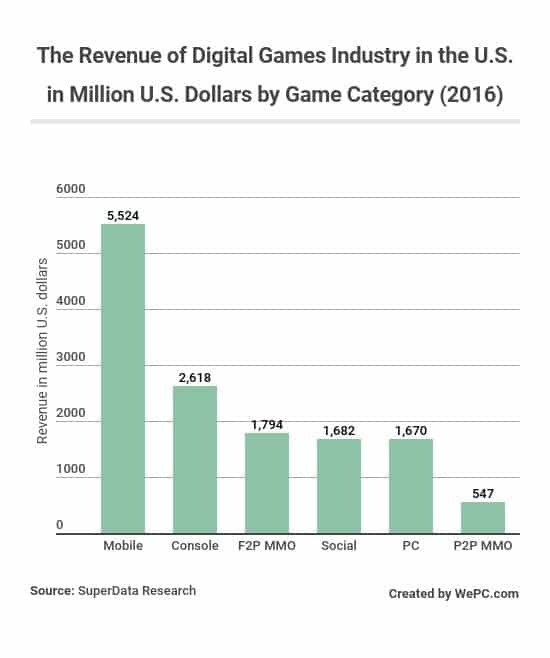 But in the recent years, the emergence of smartphones, tablets, and social networks introduced mobile gaming and social gaming as new subcategories under the video game umbrella. In America, back In the 60’s, what took up most of the video game market were arcade video games. You can find them conveniently located in amusement parks. They are so convenient that all one needs to do was to insert a coin into the machine’s coin slot and you get the joy of playing arcade games for a given time. It was different during the 70’s because this was when PCs and home video game consoles started to take over the entire video game market. It’s true that arcade games are at the top of the food chain but the introduction of PCs and consoles took the world by storm. In 2015, the value of the global video game market was 71.27 billion U.S. dollars. It was forecasted to worth 82.44 billion U.S. dollars by 2018 and about 90.07 billion U.S. dollars by 2020. As per the data gathered by WePC, back in 2011, the PC gaming market industry was valued at 15,976 million U.S. dollars. It was steadily increasing and was valued at 23,507 million U.S. dollars in 2014. By 2019, it is expected to grow by 5.8% from 2018’s expected value of 29,555 million U.S. dollars. As of 2017, PUBG or PLAYERUNKNOWN’S BATTLEGROUNDS is listed as the highest paid game titles on Steam with 27.8 million units sold in 2017. 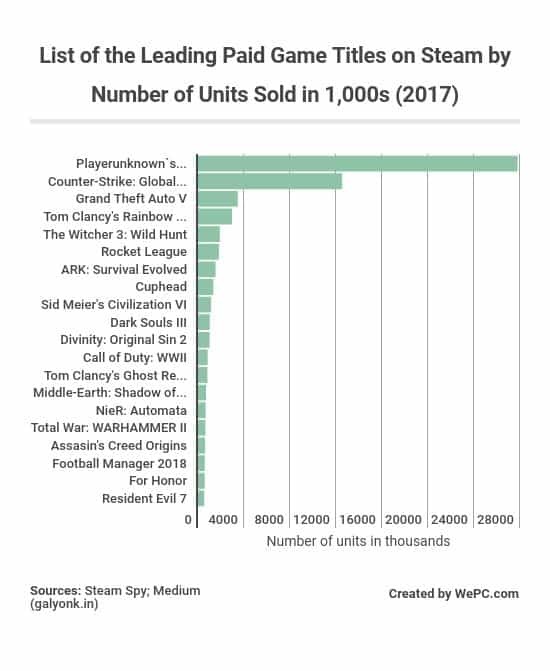 CS:GO took the second spot among the list of leading paid game titles on Steam in the same year with 12.52 million units sold. It’s not easy to tell how many players are there in the world. This goes very true if you are to factor in the fact that this number is rapidly changing every second. However, according to Spil Games reports, they claimed that there are 1.2 billion players around the world. But that’s not the great part, they also stated that 700 million among the 1.2 billion gamers were playing online games in a research they made in 2013. In 2014, Statista.com had presented a chart showing that there are 1.78 billion gamers all over the world. Interestingly, they also divided the chart and presented the data by region. Just recently, it is said that the number of gamers from around the world has finally hit the 2 billion mark, opening up new milestones and opportunities in the video game industry. 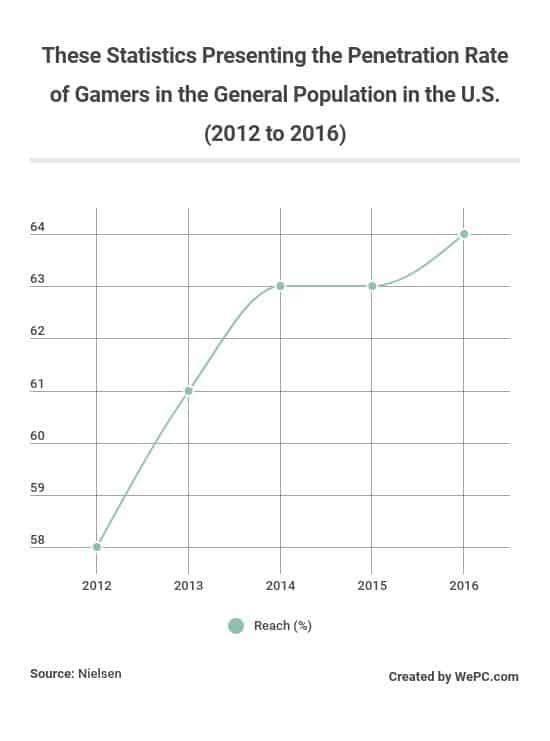 It’s surprising to see that 64% of the general U.S. population are gamers. 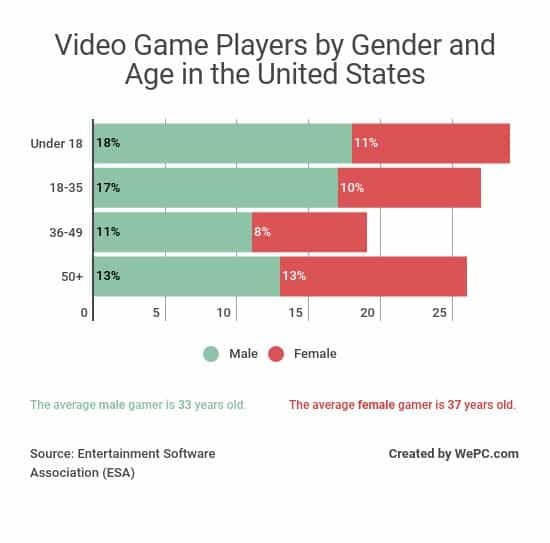 It’s also interesting to know that, according to Entertainment Software Association in 2017, the average male gamer is 33 years old while the average female gamer is 37 years old. The introduction of mobile gaming in the video game industry made a huge impact. In fact, mobile games were estimated to have generated the most revenue in the digital games industry in the U.S. According to SuperData Research, it generated 5,524 million U.S. dollars - that’s 39.9% of the total shares. Taking the second largest share are console games with a revenue of 2,618 million U.S. dollars. F2P MMO games followed the ranks with 1,794 million U.S. dollars in revenue. Surprisingly, PC games only generated 1,670 million U.S. dollars in revenue. Today, the video gaming industry certainly made considerable revenues regardless of which category it falls under the umbrella of video gaming or which region it belongs to. Considering the fact that it now has billions of revenues, it’s size now plays a major role compared to how small it was back in the days.